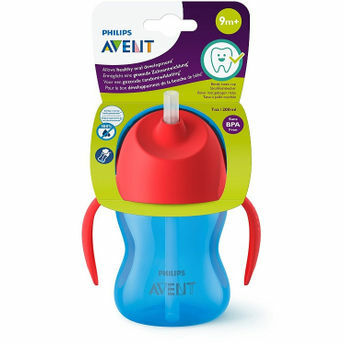 Your little one needs steady oral development and what better way to start it with Philips Avent Bendy Straw Cup. This cup has a straw which enables your child to drink 'til the very last drop thanks to the unique bent-straw. It has a contoured shape and anti-slip texture grips that make it easy for little hands to hold the cup. Parents now have the ideal straw cup for their growing, active toddler. Dentist recommended. Lower straw is bent for easy drinking 'til the last sip: The lower part of the straw is bent so that the straw easily reaches the liquid which allows you to drink in a natural drinking position. Integrated anti-leak valve & flip top design prevent spills: The straw has an integrated anti-leak valve to prevent spills. The flip top protects the straw and prevents leakage on the go. The flip top protects the straw and prevents leakage on the go.